So what is the Logeion search? The Logeion search is a tool that allows you to look up a word simultaneously in multiple reference works. It’s like a bird’s eye overview of all the things you can find out about a word from the texts hosted by the Perseus Digital Library. Sounds pretty awesome, right? It’s easy to use, too. The Logeion main search page is a simple interface. In the top center of the page is the search box. At the bottom of the page are some navigation options. All you have to do is start typing and Logeion will start to guess what word you might be looking for (even with only three letters). Notice that I’m typing with normal, Latin characters and getting both Greek and Latin results. If you only want Greek results, you’ll need to type Greek letters into the search box (if you’re need a quick refresher on how to type in Greek on your computer, we’ve got you covered). The more characters you type, the more it narrows down your search. In this case, let’s search for the Greek παράδειγμα. If I type in most of the word (without switching to my Greek keyboard), I’ll see the word I’m looking for come up in the dropdown box and I can click on it. But be careful: the Logeion search box isn’t a parsing tool. If you type in an oblique case, you won’t get the results you were looking for! There’s a lot going on here! In fact, there is way too much to fit on the screen. The outer panes remain visible the whole time, but scrolling down the center pane will give you even more information on the word you just looked up. Let’s take a look at what’s on this screen first! 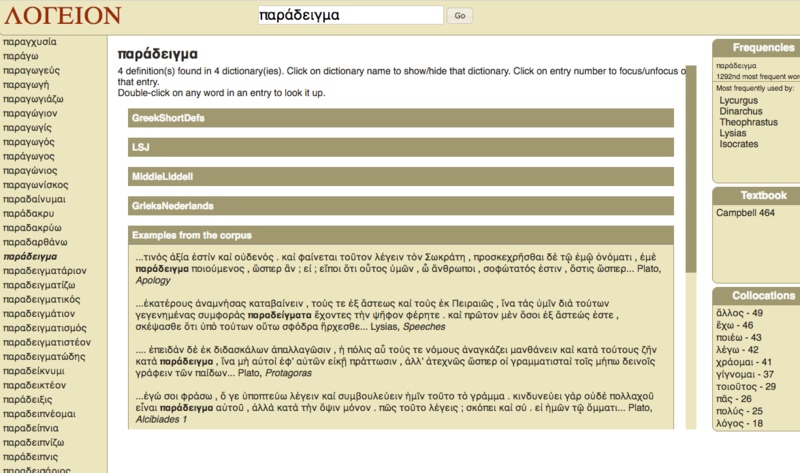 The left-hand pane is a list of the Greek words that appear next to your search term in the dictionary. You can see if there are other words based on the same stem very easily and click on them (and then click back to the word you were looking up). This page is basically the Greek Text search that we covered last week, only this set of results is already limited for you by author. You can change the view to the KWIC report, and each of the results provides a link to the work and passage that contains the word. Back to the main results page. Under the Frequencies panel is the Textbook panel, which lists (without links) all the places that particular word exists in the textbooks that Logeion has in its search collection. Under the Textbook panel is the Collocations panel. Collocations are groups of words commonly used together in a particular language. The Collocations panel gives you a list of the words that are very commonly used alongside your chosen word. Clicking on one of them opens up the Logeion information page for the word you selected. You can easily navigate back to your original search with your browser’s back button. Now I hope you didn’t forget that center panel! The center contains individual tiles with information on your search word in any of the dictionaries that Logeion is searching. 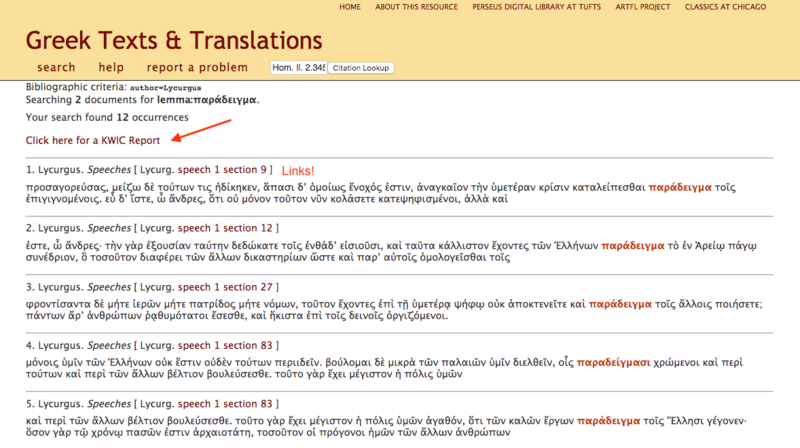 In this case, there are definitions for παρἀδειγμα in four different dictionaries (only the first three fit in the screenshot). You can click on the names of the dictionaries to collapse the panels and see the examples from the corpus at the bottom (or just scroll down). Under the dictionary results, you’ll find examples of your search term in the corpus (that is, the entire Perseus Digital Library). It’s important to note here that this is just a selection of the appearances of your search term in the corpus. If you want a comprehensive list of every instance of your word in all of the texts in the Perseus Digital Library, you’re better off doing a Greek or Latin texts and translations search from the main page of the Perseus under Philologic site, which I covered in the previous post. What you can see on the Logeion search that’s really useful is all of the data associated with the word: the authors that use it most frequently, related words, and collocations. 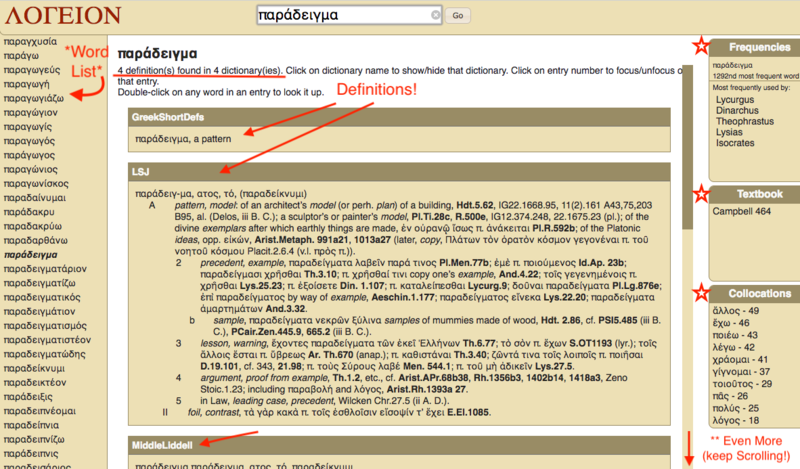 You can also compare the dictionary entries for the word across all the dictionaries at once in Logeion. It makes a great first step in an analysis of a Greek or Latin word that can help guide you in a more thorough search later on. Logeion is a really powerful search tool that will give you a great overview of your particular word, but it’s not a parsing tool and it’s not a complete corpus search. For those kinds of searches you’re better off using the Greek or Latin search pages. That concludes my tour of Perseus under Philologic; stay tuned for our review of Perseus 5.0, coming soon! In the meantime check out the new reader! @LibAntiquity Think of it as a remix not a mirror. Btw. If you paste in inflected form (with diacritics) and it’s in our db you will get a parse. Else it will dump you in approx alphabetical location. There is also a free app for Logeion (IOS and Android) that includes all the dictionaries from the website without requiring internet access or data. The functionality is identical to the online version, but you will need a Greek keyboard to lookup Greek lemmata (very easy to access on IOS, I don’t personally know about Android). I have recommended and used the app for my students and gotten very positive feedback from them as well.